Mushrooms are always a hit too, especially when they get marinated by the salad dressing. Peas, corn, sundried tomatoes, chopped up kale – throw in whatever you like. To finish it all, you need some type of cheese to sprinkle all over, I like to add some shredded mozzarella. How do you like your pasta salad? You can make your pasta salad with a wide variety of noodles, so use what you like. 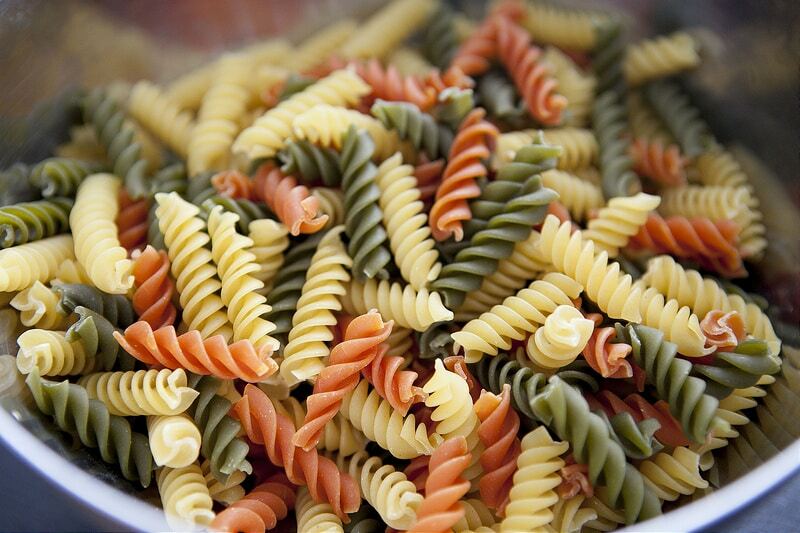 I’ve been making our pasta salad with tri color rotini pasta. The extra color kick of this pasta makes it special in my opinion. Bow ties and penne pasta are great too! Finally, pasta salad is a favorite because you can make it advance. You want it chilled, so all the pasta and vegetables pick up that salad dressing taste. 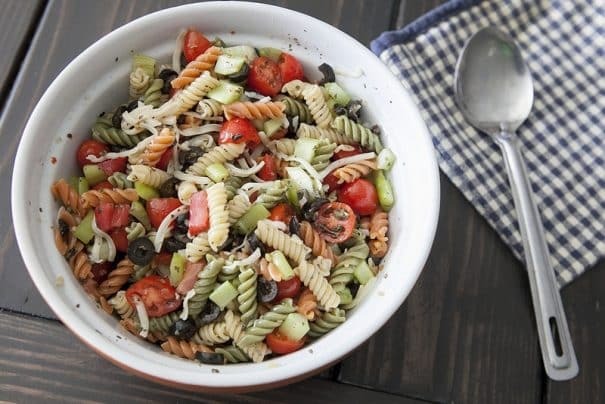 Plus when it’s a hot summer day, a little chilled pasta salad will bring your spirits up. You can make this a few hours in advance, or even the day before. If I have leftovers, I will eat it for a few days after. The celery stays crunchy, I love that. 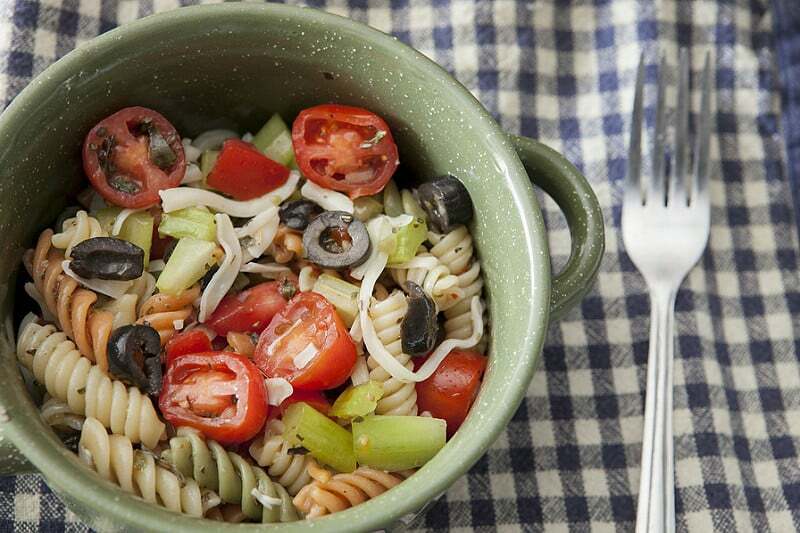 So go ahead, let’s make it feel like summer and make some tri color pasta salad. Pretty vegetables. I love black olives, but Matthew hates them. 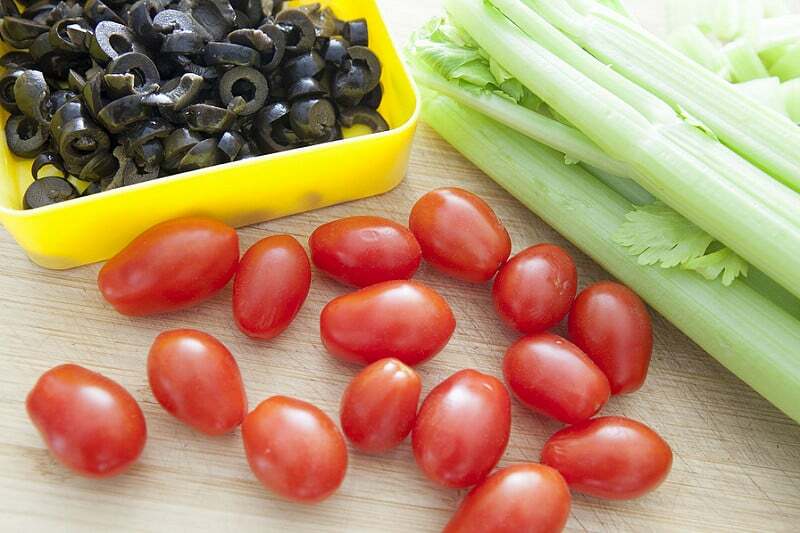 When he eats pasta salad, it’s just a bowl left of black olives. Then I steal his bowl and eat them all. Tri color pasta – it’s a beauty, isn’t it? This serves up a big fresh bowl of pasta salad. 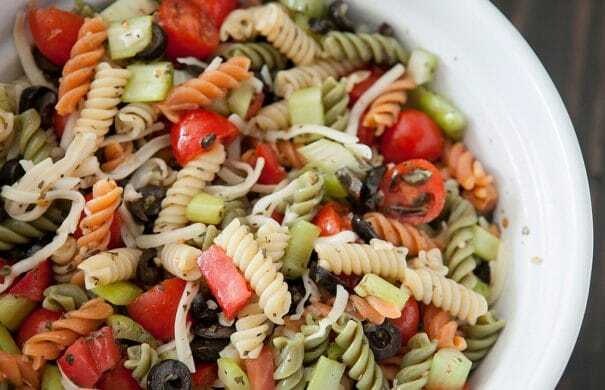 Enjoy this tri color pasta salad! Make sure to try my Italian Pasta salad recipe and Rainbow Kale Salad too! Prepare your pasta as directed. Drain. Put your pasta in a big bowl. Add your chopped vegetables, salad dressing and dried herbs. Mix together so everything is coated in salad dressing. Add in your mozzarella cheese, toss around. Cover, put in fridge to chill. 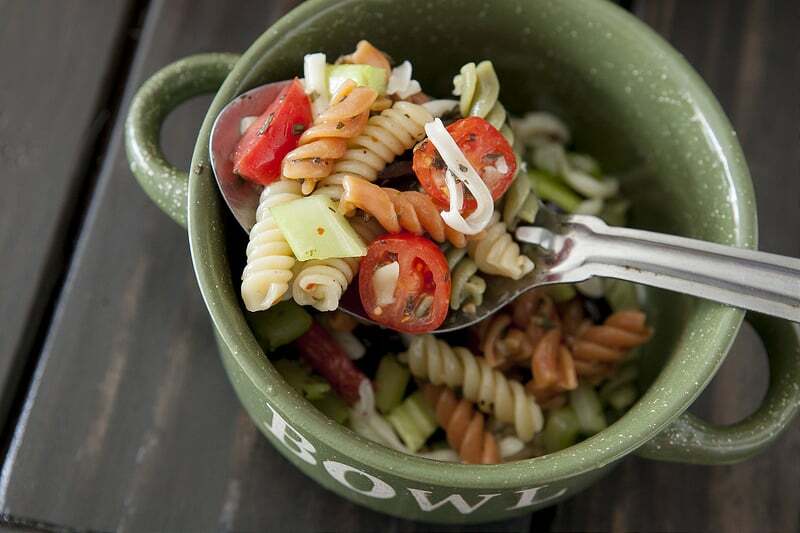 If your pasta salad looks a little dry when it comes out of the fridge, add a tablespoon of salad dressing and mix. 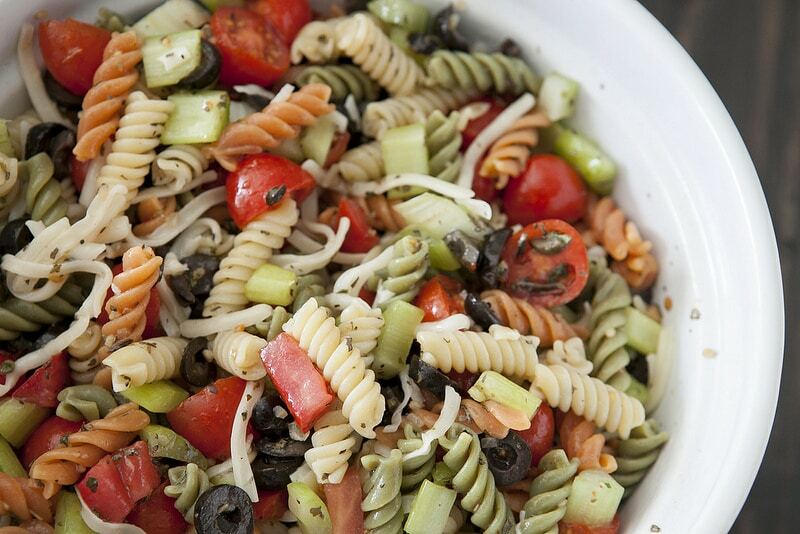 Pasta salad is my favorite summer dinner! Your photos are absolutely gorgeous! Thanks Dorothy! I love it too! I love making easy yet tasty pasta salads like this one, on weekdays, with whatever is lying in the fridge & pantry. We make a similar recipe like this when it is BBQ time over here! Yours looks very appetizing too! MMMMM – that sounds delicious! Your pasta salad looks totally delicious, I love that it has mozzarella and black olives in too. I always end up eating other people’s left over olives as well, they definitely seem to be a love or hate food and I fall into the love category! I would totally set weather alerts if the weather in Arizona actually changed often enough. I’ll send some warmth and sunny thoughts your way! It looks wonderful! I may have to make this for lunch with my leftover pasta. That would be a yummy lunch! What a pretty pasta salad! And packed with flavors too I imagine. Great dish for those nights when you don’t want to put too much heat in the house. Lovely post Pamela. Thanks Anne! It’s such a easy meal for a large group of people and packs such a delicious punch! Blimey I forgot how great pasta salad is. I like it with all the above and some sweetcorn kernels too. Raining here too by the way..
Oh my, love the crunch of the kernels. What a great idea, thanks! It went from dull to too hot… this still makes a great food for those sunny summer afternoons! I JUST made pasta salad last night, but it’s all gone now, and this post has me wanting MORE!!! Looks so fresh and tasty. MMMM, I think I will be making more this weekend! I love pasta salad! It’s always felt like a special occasion food to me. Even though it’s super simple to make, it wasn’t in my mom’s recipe rotation when I was growing up. The only time I had pasta salad as a child was at someone else’s house (ie, barbeques, etc), so I thought of it as a treat. That’s a great special way to think of it! It brings back alot of family memories for me at summer gatherings. 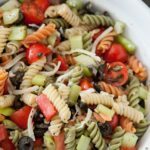 I love pasta salads–they are easy to make and such a great option for busy days or to bring to a picnic! Love it! Love how quick and easy it is to make! Can’t wait to try the recipe. Just made this for lunch, so yummy!